I am not a morning person. By any stretch of the imagination. While I appreciate the beauty of watching the sun rise and the quiet start of a day, I too often give into my night owl tendencies. Thus, my perfect morning generally involves a late start and slowly waking up over a mug of black breakfast tea. However, this morning, waking up early was totally worth it. Because this was wedding day for our friends, the only way for the groom to take us on an excursion before the evening event was to go early this morning. (Despite the early start, the bride was not able to join us because her preparation would take all day.) 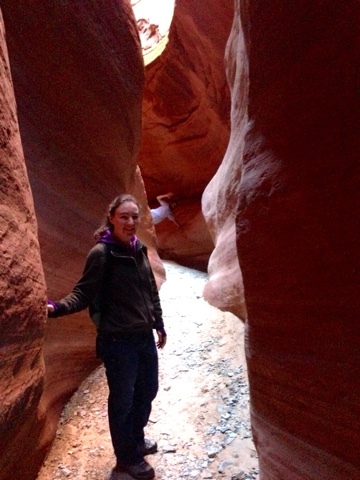 Today’s adventure was to involve a ride on a side-by-side and a hike in a slot canyon. Neither of which I had done before, so I had no idea what to expect when we set out that morning. Side-by-sides are like off-road golf carts that drive like four-wheelers. 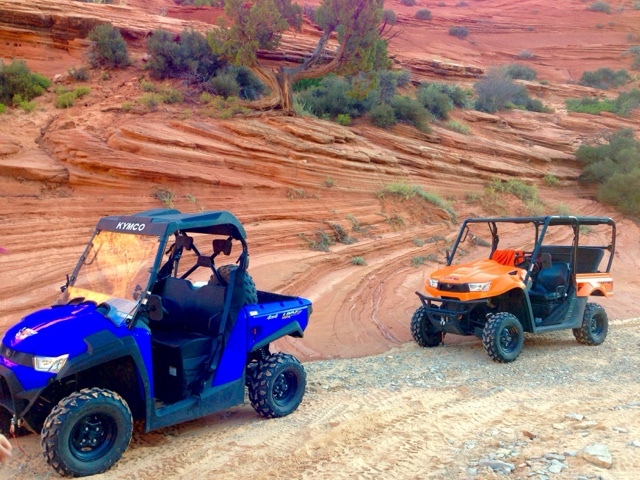 I learned that these are a very popular form of recreation in the area around Kanab and there are several trails just for their use. 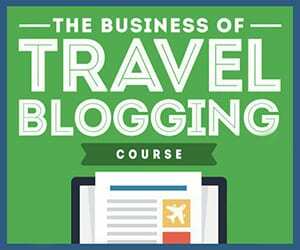 (I googled- there are several companies from which you can rent side-by-sides in/near Kanab. I suggest looking into it if you’re in the area.) Lucky for us, the groom’s family owns two- one three-seater, and one four-seater. So seven of us piled into the truck, towing the side-by-sides, and the following car, and drove a half hour outside of Kanab to the Peek-A-Boo Slot Canyon trail head. We would drive the side-by-sides to the start of the slot canyon, where we would walk a half-mile to the end and turn around. I rode in the first side-by-side, squeezed tight between Micah and Trevor, the groom, who took the wheel for the ride in. The four others followed in the vehicle behind us. 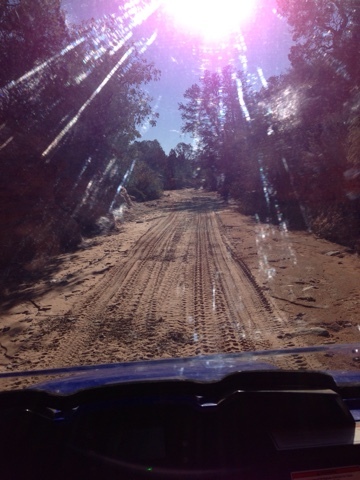 The sandy trail was deep and the sand slid out from under our wheels as we drove. We bumped up and down, forward and back, and although we only pushed the speed to about 30mph, it felt much faster! The ride was harrowing, but I must admit, fun. 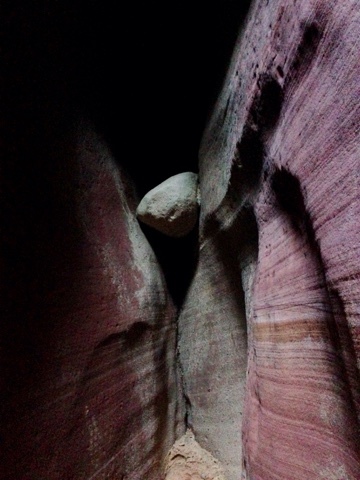 Before long we arrived at the slot canyon, where we parked the vehicles and continued on foot. 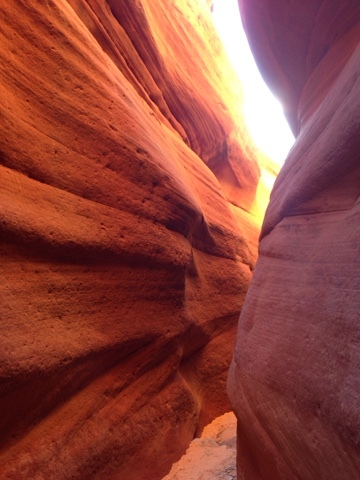 Our hike through the slot canyon was beautiful. The rising sun glowed gold as it rose over the red cliffs and peeked around corners of the canyon. Walking through the slot was awe inspiring. I definitely enjoyed being at the bottom of the canyon looking up the walls than above looking down, as we had been at Bryce Canyon. Although we were making all sorts of noise, in the fleeting moments when our voices ceased, the quiet was serene and I was happy to be standing there taking it all in. Our trail lasted for about a half mile before we hit a rock wall where we were forced to turn around. Until we’d returned to the side-by-sides, I hadn’t realized how lucky we were to have the canyon to ourselves. A jeep and four large range-rovers full of tourists pulled in just as we climbed back into the side-by-sides. I was glad we had gotten there earlier than the tour groups. There may be something to this waking up early after all. 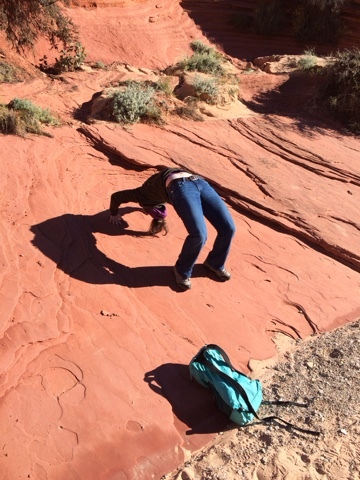 Pilates in the canyon. Getting my morning exercise in! Micah took his turn at the side-by-side wheel during the drive back. Lucky for me, as he’s not as experienced with these vehicles, he drove slower than Trevor had. Unfortunately for me, Micah kept taking less well-groomed side trails, making the ride quite bumpy. Eventually we found ourselves completely off trail. Micah drove over shrubs, startled deer, which had to leap out of our way as we crested sand hills, and accidently took us up to the edge of a large drop off. From here we backtracked and were able to find the trail again. 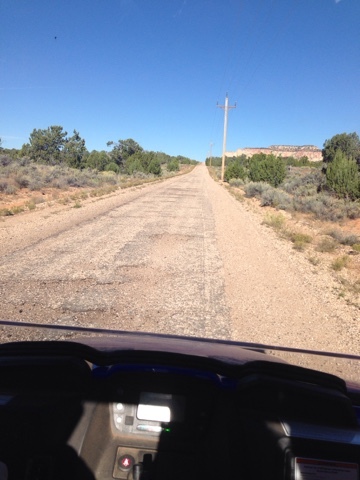 We reached the car park with time to spare, so Trevor suggested we take a drive on the old, abandoned, Kanab highway, which happened to run right along the side our parking lot. Micah pushed the vehicle speed to 40mph as we zoomed along this crumbling forgotten road seemingly only used by off-road vehicles now. Finally we returned to the trailhead. I discovered that the desert is much cooler in the morning, so by 10:30am when we finished our excursion and I was baking from the day’s heat, I was happy we had set out early. When I clambered out of the vehicle, I discovered that I was CAKED in fine sand. It was EVERYWHERE! In my ears, nose, eyes (and I’d been wearing sun glasses! ), my face felt grainy. I so needed a shower. Rather than shower, however, Micah and I decided to head into Kanab’s downtown for lunch, a little geocaching, and to explore the touristy gift shops. The rest of our party returned to the house to clean up and rest before the wedding. Being our last day in town, this was our only chance to actually see the town we were staying in. So, Micah and I sprayed sun screen over the layer of sand, and drove into town. After a look at Yelp reviews, and a drive by the few lunch options, judging them by how many people were inside, we settled on Big Al’s Burgers. We got two burgers, a fries, and a milkshake (blueberry!) 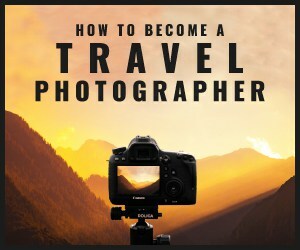 for only $12! After a surprisingly satisfactory lunch, our next agenda item was earning our Utah Geocaching souvenir. 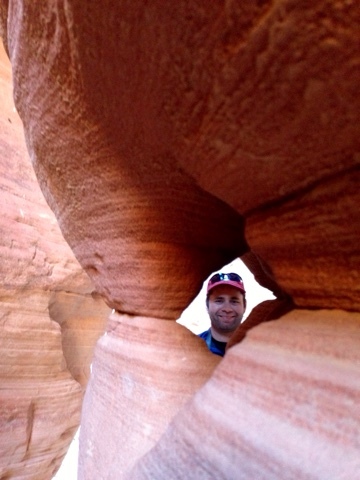 (Read about Geocaching in my other post) Kanab’s nick-name is “Little Hollywood”, due to the many old Westerns that have been filmed there. Throughout the downtown there are plaques commemorating the various actors that have been part of Kanab’s film history. A few of these plaques happen to contain micro geocaches. Killing two birds with one stone, we found a cache and the tourist shops all in one place. While we ate lunch I had watched a trailer of horses drive by. There’s also a rodeo ground outside of Bryce Canyon. 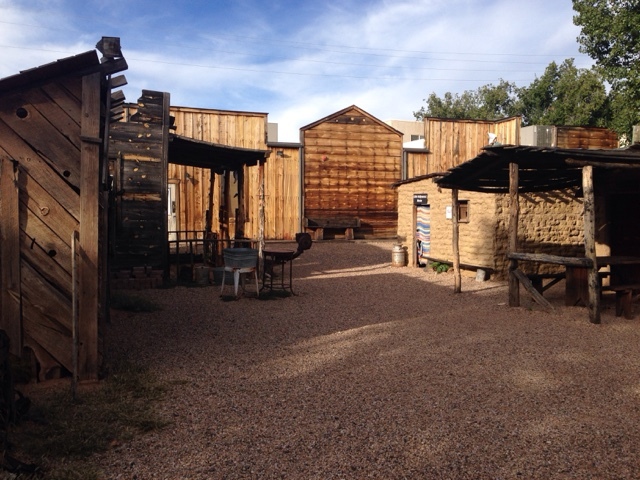 Thus, each tourist shop sells any and all parts of the cowboy outfit that might be missing from your closet: boots, shirts, hats… These Western items are of course sold right next to the Native American Indian crafts which include beadwork, clay pottery, dream catchers, and woven bowls. (Whether the dream catchers or any of these items are really traditional, rather than just trinkets that sell to tourists, is a debate for another time…) Ignoring the cowboy ensemble, I found a couple vases, a dream catcher, and a beautiful pair of dream catcher earrings to take home. My favorite shop, however, was of course the bookshop, where I found a Bill Bryson book I hadn’t heard of before! 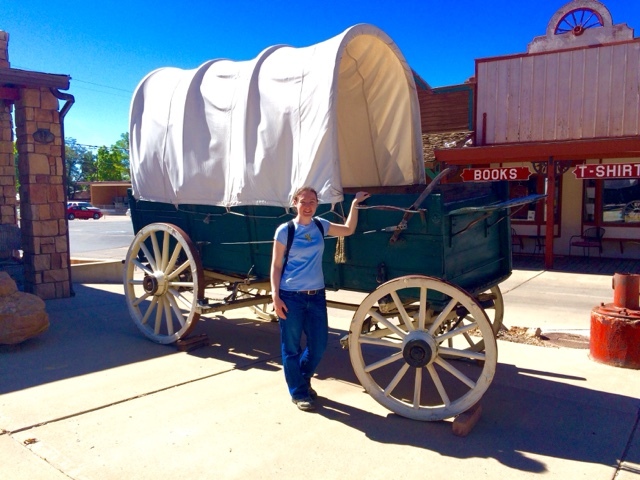 Downtown tourist shop street Kanab wouldn’t be complete without a covered wagon. Finally it was time to return to the house, shower off the sunscreen and sand, and dress for the wedding. 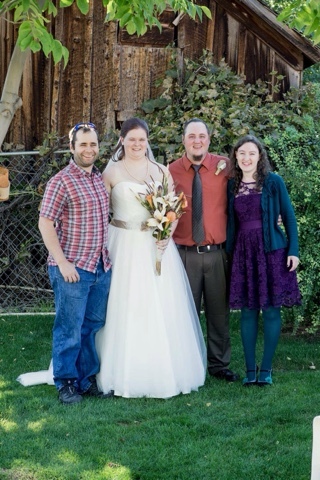 The wedding was a wonderfully small affair in the backyard of a neighbor, with one of our house mates officiating. Kaydee made a beautiful bride, wearing a white poufy dress. The wedding was short and entertaining. (Not at all because Kaydee cried and her mascara ran, making her look like a zombie bride…which I totally won’t record for posterity on my blog…) Afterwards, we returned to the groom’s parents’ house for our third and final dinner on the patio. Micah, Kaydee, Trevor, and Me! Congrats Kaydee and Trevor! We’re so glad we could spend this special day with you!